On Thursday, December 6th, the Reno-Sparks Convention and Visitors Authority Board of Directors held its annual retreat at the Reno-Sparks Convention Center, providing an opportunity to assess the success of the RSCVA’s five-year Strategic Plan and the immediate and long-term direction of the organization. Numerous community stakeholders also in attendance were encouraged to take part in the discussion and offered comments and suggestions that could impact the RSCVA and the tourism industry in northern Nevada in the future. Highlights from the retreat are summarized below. Successful and thoughtful strategic planning are essential ingredients for any progressive and effective public entity. The RSCVA Board of Directors, its professional staff and engaged members of the community and tourism industry all play a vital role in ensuring the vivacity, robustness and positive results the RSCVA consistently strives for. Many thanks go to our Board of Directors who volunteer their time, and to OnStrategy who facilitates and measures our progress with strategic planning. Thank you for your continued interest in northern Nevada tourism. The Board reviewed the positive state of the RSCVA in relation to the organization’s targets, goals and objectives. The members of the Board discussed, reviewed and commended the effectiveness of the RSCVA meeting its core mission, which is to attract overnight visitors to Reno Tahoe through various strategic divisions, specifically destination marketing, convention & leisure sales and the promotion of special events. The session explored international, national and regional trends that could influence Reno Tahoe in its next fiscal year. Climbing interest rates by the Federal Reserve, recent volatility of America’s stock markets, trade wars and visa restrictions were all considered as possible indicators of economic influence. Conversely, the Reno Tahoe area is experiencing unprecedented economic growth in the Tech sector and related industries. Popular opinion points to continued development, economic and population growth for the region. In response to these divergent economic indicators, the RSCVA’s budget forecast for fiscal year 2018-2019 will remain conservative and will be evaluated again as the budget process evolves over the coming months. The Board and community stakeholders expressed strong approval of the existing excellent partnership between the Reno-Tahoe Airport Authority and the RSCVA, emphasizing the importance on maintaining a cohesive alliance throughout the community as a catalyst for continued increases in air service. Community stakeholders and the Board were complimentary of the organization’s recent sales and marketing successes and supported the position that the RSCVA’s current strategic priorities are compatible with continued success of the region’s tourism industry. The effort to increase tourism awareness and accessibility to Reno Tahoe by repositioning the destination in key feeder markets has been an ongoing success. Since Fiscal Year 2016-2017, when the RSCVA launched a completely new brand and advertising campaign, the destination also entered into two new markets (Seattle and Los Angeles). The RSCVA established multiple influencer programs and contracted with national public relations firm Decker Royal. As part of the rebranded marketing campaign, more than 1.9 million visits were recorded to VisitRenoTahoe.com within the first six months of launching. Market research and data analytics firm EMC Research conducted a brand tracking survey this past May, which included brand awareness metrics for all three primary target markets: the San Francisco Bay Area, Los Angeles and Seattle. Of respondents belonging to the demographic target in the Bay Area, 81% reported taking action, including visiting the website and seeking additional information, following exposure to Reno Tahoe advertisements. Respondents fitting that description in Los Angeles (84%) and Seattle (80%) also self-reported a high propensity for action, demonstrating that the initiatives taken to implement this strategic priority have been effective. Upon review, the Board advised staff to maintain brand presence in Seattle, with a continued focus on increased air service in partnership with the Reno-Tahoe International Airport. Increased marketing spend and expanded tourism sales efforts into core target markets of Los Angeles and the Bay Area were also recommended. Increasing overall hotel occupancy and average daily rate (ADR) were noted as key measures of success in achieving the organization’s core mission. The proposed targets included producing an average of 70% for hotel occupancy and an Average Daily Rate (ADR) target of $100 by Fiscal Year 2019-2020. Both goals were achieved by the end of FY 2017-2018, indicating that the RSCVA is on a growth trajectory, as is the hospitality business as a whole in northern Nevada. Collaborative efforts of the sales and marketing divisions along with substantial property upgrades have significantly contributed to driving the ADR up. The RSCVA convention sales department has successfully opened new sales development offices in Atlanta, Chicago and Sacramento to complement sales offices in Washington, DC, Denver, Portland and southern California. The destination enjoys continuing success with the booking of citywide convention business, with examples such as Safari Club International (18,000 room nights), National Guard Association of the United States (10,000 room nights) and the Department of Education (15,000 room nights) – that will meet in December of 2019, bringing desired compression in the market during a traditionally very slow tourism month. The Biggest Little Site program, an immersive, quick and fast-paced 24-hour tour of Reno Tahoe, was implemented to give meeting planners a unique, all-inclusive experience of our destination. 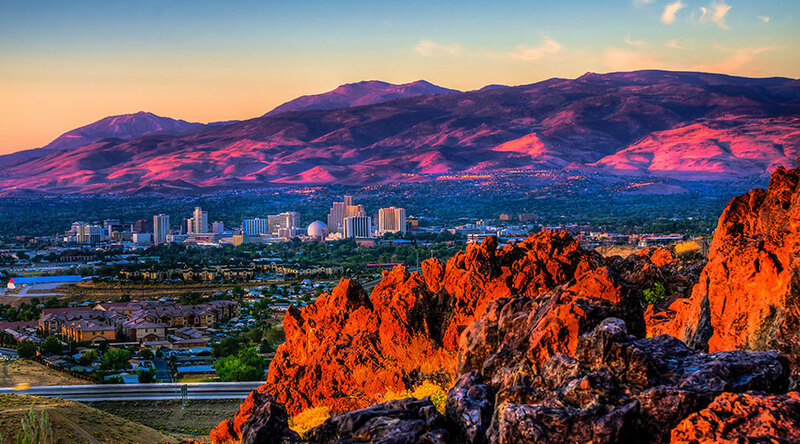 Longer multi-day Familiarization trips (FAMS) for potential customers, out-of-market client events, and the Biggest Little Site continuously leverage Reno Tahoe as a world-class destination for meeting planners and the valuable conventions and meetings they represent. Through these and other efforts, the convention sales department exceeded its goal for FY 2017-2018 by 22% and has increased its goal for the current fiscal year from 260,000 to 280,000 room nights of future business booked. Primary goals for the department include increasing new business through current strategic programs, increasing annual group room night production by approximately 7%, and identifying synergies to bolster group sales with SMG, the worldwide leader in facilities management and operator of the convention center here and three other facilities. Long-term strategic goals include the addition of remote sales development offices in target markets and an expanded media campaign. Since FY 2017-2018, the tourism sales department has been restructured and expanded, bringing a renewed advocacy to leisure and tourism sales for the destination. Internationally, PHG Consulting now represents Reno Tahoe in China. Efforts to bring Chinese visitors to Reno Tahoe include leisure sales and media FAMs, tradeshows, training and support regarding consumer-friendly services such as WeChat and China Union Pay. Through PHG’s five offices in China, we further position Reno Tahoe as a key tourism destination for the international Chinese traveler, now numbering 128 million. Executive Vice President of SMG, Gregg Caren and Regional Vice President John Adams reported to the RSCVA Board their findings and financial results of the first six months of their operations of the Reno-Sparks Convention Center, Reno-Sparks Livestock Events Center, National Bowling Stadium and Reno Events Center. In order to achieve success, the RSCVA continues to nurture the professional growth and development of its people, have meaningful and smart processes in place, and embrace technology improvements. In addition to reaffirming a commitment to the factors contributing to organizational stability, the Board encouraged staff to continue practices and strategies to leverage collaborations and partnerships within the community. Citing the RSCVA’s existing, strong relationships with the Reno-Tahoe Airport Authority, EDAWN and the Reno-Sparks Chamber of Commerce, the Board affirmed staff efforts, recognizing that the community and hospitality industry is much stronger in this era of collaboration. The Regional Air Service Corporation (RASC) was also discussed and reviewed – with the board galvanizing that RASC is an essential driver for attracting new air service to the region and that increased funding was an integral objective and pathway to successful improvements in airlift. The Board voiced support for a potential 125,000 square-foot expansion to the Reno-Sparks Convention Center and discussed and reviewed data surrounding the early estimated costs ranging from $105-$135 million. This cost would include earmarks for the renovation of the Reno-Sparks Livestock Events Center and areas of the existing Convention Center needing a new look, and not touched by any possible expansion. This project will ideally need support from the Nevada Resort Association to ensure support by the Legislature. If approved in the upcoming session, the expansion would be scheduled for completion by 4Q of 2022. There are numerous advantages to the potential expansion, including opportunities to attract new business, meet the exhibition growth needs of existing business and offer an improved and enlarged facility to showcase for the convention and tradeshow industry. Prior to the retreat, the Board of Directors held a December Board Meeting, during which the demolition of the dilapidated Armory building and aged exhibit hall at the Reno-Sparks Livestock Events Center were approved to move forward.